Image from Giving birth--the most dangerous thing an African woman can do? In resource-rich countries, the debate about how to best deliver breech baby is largely focused on reducing a very small risk of death or serious disability at the price of increased maternal mortality and morbidity and problems in future pregnancies. 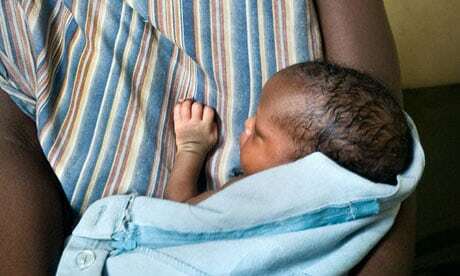 However, in the developing world, the debate around breech has a unique set of implications and consequences. In resource-poor countries, perinatal mortality rates are often high, health infrastructure is low, and providing even basic care to all pregnant women is a challenge. Cultural values about vaginal birth and attitudes towards cesarean sections may also differ from the developed world. Below are excerpts from several articles published after the 2000 Term Breech Trial that examine breech birth in developing countries. (I was working alphabetically through my reference list. I started compiling excerpts while on letter "I," hence the lack of authors from A-H). Igwegbe AO, Monago EN, Ugboaja JO. Caesarean versus Vaginal Delivery for Term Breech Presentation: A Comparative Analysis. African Journal of Biomedical Research 2010; 13(1) Full text here. The implication of this finding is that in well selected patients, neonatal outcome following assisted vaginal breech delivery and planned caesarean section may not be different. Owing to the high level of aversion to caesarean section by our women (Aziken et al., 2007; Ezechi et al., 2004), as well as the associated surgical risks, a whole scale policy of caesarean section for all cases of term breech delivery may not be feasible in our environment. Moreover, the policy will inevitably lead to an overall increase in caesarean section which will put a strain on the very limited resources in the region. As breech presentation is not a recurrent indication for caesarean section, most of these women who had caesarean section will attempt vaginal delivery in their subsequent pregnancies with the associated risk of uterine rupture. Owing to the very high premium placed on vaginal delivery by the African women and the fear of a repeat caesarean section, a significant number of these women may not present to a proper health facility for management. The consequence is increased likelihood of uterine rupture and the attendant maternal mortality and morbidity. Furthermore, in Africa, labour and delivery are not just medical matters, but carry a huge cultural significance. Any intervention that will affect the attitude of the people towards labour and delivery must consider the cultural aspect. Mishra M, Sinha P. Does caesarean section provide the best outcome for mother and baby in breech presentation? A perspective from the developing world. J Obstet Gynaecol. 2011 Aug;31(6):495-8. [O]ffering CS to all patients does not improve the neonatal outcome significantly. This study highlights that case selection for planned vaginal deliveries is still a viable option. Mohammed NB1, NoorAli R, Anandakumar C, Qureshi RN, Luby S. Management trend and safety of vaginal delivery for term breech fetuses in a tertiary care hospital of Karachi, Pakistan. J Perinat Med. 2001;29(3):250-9. Vaginal birth is generally considered better for mothers than cesarean section, as one avoids the operative complications associated with major abdominal surgery and an increased cost of birth. In developed countries, the risk of maternal death due to cesarean delivery is 2 to 30 times higher than that observed with the vaginal births. However, in developing countries, these figures are alarming, where there are 3-6 maternal deaths for every 1000 cesarean deliveries and where every eighth in-hospital maternal death is attributed to cesarean section. Moreover, trial of scar is associated with the risk of uterine rupture (7/1000) and there is a significantly greater post-partum morbidity after repeat cesarean section than after a vaginal delivery. In Pakistan, this issue is further complicated by the lack of adequate documentation about the indication for the previous cesarean section, the stage of labor at which it was performed, the type of uterine incision and the course of post-operative morbidity/recovery. Moreover, the patient’s desire to avoid cesarean birth due to social pressure may result in avoidance of antenatal care and hospital deliveries in subsequent pregnancies. As more and more obstetricians turn towards elective cesarean section as delivery mode of choice for breech infants, the trainee obstetricians would loose [sic] the opportunity to acquire skills for safe vaginal birth, with the resultant loss of this delivery option to be offered to the parents. Orji EO, Ajenifuja KO. Planned vaginal delivery versus Caesarean section for breech presentation in Ile-Ife, Nigeria. East Afr Med J. 2003 Nov;80(11):589-91. [T]he policy of wholesale Caesarean section for delivery of term breech infants as being advocated and practiced in many centers in developed countries needs re-appraisal. There is no clear benefit of abdominal delivery where strict selection criteria is employed...increased maternal morbidity attending abdominal delivery would make Caesarean delivery a less favourable option, especially in our environment where there is a great aversion to Caesarean section and where the woman cannot be guaranteed to report for monitoring in subsequent pregnancy if at all such monitoring facility is widely available. Sobande AA1, Archibong EI, Abdelmoneim I, Albar HM. Changing patterns in the management and outcome of breech presentation over a 7-year period. Review from a referral hospital in Saudi Arabia. J Obstet Gynaecol. 2003 Jan;23(1):34-7. However, the meta-analysis by Hofmeyr and Hannah (2001), which alluded to the findings of previous authors [Golfier 2001, Herbst 2001, Hannah 2000], did not assess the cost and future morbidity as a result of the caesarean section scar. This will be very relevant in our society, where grandmultiparity is common and patients may be having their 6th or 7th caesarean section…. Our community, being a developing one, still prides itself on the size of the family and, as such, it seems logical to try to allow vaginal delivery in breeches with the safety of the mother and baby still the priority. With a sizable proportion of childbearing women in our society being grandmultiparae, the risks of repeat caesarean section especially placenta praevia accrete increases. It was shown by Zaki et al. (1998) that the incidence of emergency hysterectomy in cases of placenta praevia accreta was 50% compared to 2% in non-accreta. It will therefore seem reasonable to attempt to reduce the trend of caesarean section for breeches in our community…. This study showed no birth trauma in 1997 while birth trauma resulting from breech delivery was highest during 2000. This may be due to the quality and experience of the registrars working in the department at the specific periods in time. van Bogaert LJ, Misra A. Neonatal outcomes after vaginal and caesarean breech delivery. S Afr Med J. 2007 Oct;97(10):949. In developing world settings, and especially in rural conditions, a proper management plan before the onset of labour is often not achievable. The unpopularity of the prospect of a CS prompts women to delay admission to the labour ward until in established labour. van Eygen L1, Rutgers S. Caesarean section as preferred mode of delivery in term breech presentations is not a realistic option in rural Zimbabwe. Trop Doct. 2008 Jan;38(1):36-9. In this rural setting only a minority of women deliver in district hospitals. Thus, women with an easy vaginal breech delivery (at home or in a clinic) resulting in a live baby were not taken into account in this study. If all breech presentations at term were delivered by CS, then even more CS would be performed but at a lower percentage of babies would benefit. The lack of correlation between the BrPNMR [breech-related perinatal mortality rate] and the CS rate, and the high mortality rate after CS, make a strong case against the systematic delivery of [breech presentations] by CS in this setting. Rather, attention should be given to improving the overall management of breech deliveries.